SPMH and Music Hall are a big part of Carol Kruse’s life! She’s been a member of our organization almost from the time it incorporated, and has been giving tours since 2009. Carol is so in love with Music Hall that, when she lived in Melbourne, Australia, she brought along a watercolor painting of the structure to hang on the wall of her flat! 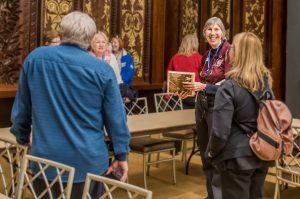 In her volunteer work as a Program Guide, Carol loves to share her passion for Music Hall with others. and come to performances there as well! And when they attend performances, they likely will see Carol. She has subscriptions for all the resident companies – the Symphony, Pops, May Festival, Opera and Ballet. Her tour skills also support the city of Cincinnati, as Carol leads city (bus) tours for out-of-town groups for Accent on Cincinnati. Along with her volunteer work for SPMH, Carol has just completed 6 years on the board of the Three Arts Scholarship Fund, which awards scholarships to female college students majoring in music, musical theater/drama and visual arts. Carol is a member of a number of area choruses including Voices of the Commonwealth, One Voice (singing at retirement and nursing homes), Westchester Chorale, and October Festival Chorus. And she’s been treasurer of her church for the last 22 years. When not singing or leading tours, Carol can be found birding in area parks and nature reserves, at University of Cincinnati football and basketball games, or on a trip to faraway places. She’s enjoys traveling and set foot on all 7 continents, including Antarctica.